We are still on the mission to find the "perfect" snack. After perusing food blogs, we went back to Chocolate Covered Katie and decided to recreate this recipe. Combine all ingredients in food processor (except coating ingredients) until mix is well incorporated. It may seem like it will never mix, but trust me, it does :). divide in to equal servings and roll in to balls. I made 6 out of mine, but I think 12 is really more size appropriate. 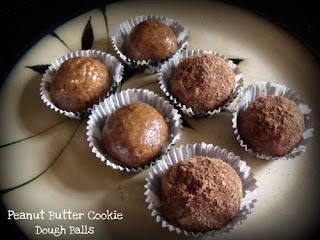 If you want to coat them, mix the two dry ingredients and then roll balls in the coating. Ed liked these. I liked these. The coating is good, but a bit bitter until you get it mixed with the dough part. Yum, Angie! Love these healthy little bites!! :) Thanks for sharing. Peanut butter is a favorite in our house!! I would L.O.V.E for you to blog about my blog :) looking forward to checking your blog out :) Have a great day!